Weekdone is all about knowing your team better. Some of the insights we provide are textual. These include planned and accomplished tasks or feedback question categories like ideas for improvements. Just as important for busy leaders and team managers though are our actionable team and employee dashboards. At a quick glance we show visually who needs more attention, who's doing great and which indicators lag behind. The best thing, unlike some analytics dashboards, everything in Weekdone is actionable towards people and teams – those who can drive real change. For years Weekdone has been praised for such visual team dashboards. Additional 5-point scale rating questions. Revamped dashboard with better history graphs. 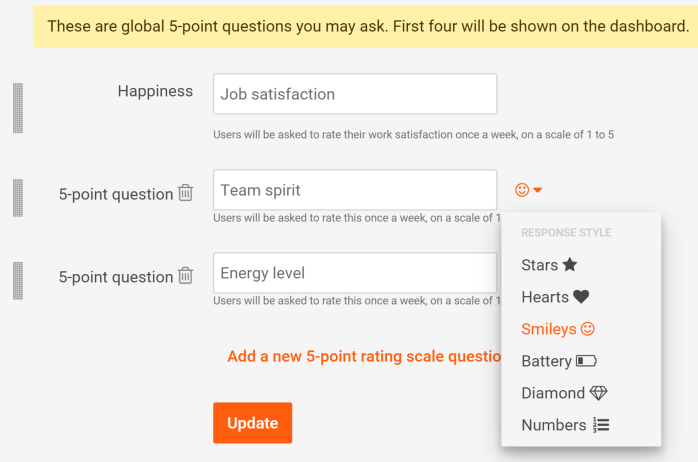 Until now Weekdone internal communication tool users have enjoyed asking their people once per week what their job satisfaction and happiness is. It has been a great way to know your team morale, to feel their pulse. Whenever you see a one to three star rating instead of the positive 4 or 5 stars, as a leader you know you should immediately talk to the person and find out what's wrong. Many issues have been solved this way, many encouraging pep talks conducted. But you've also asked though for the possibility to ask other 5-point scale questions. Now you can. Just head to your company template settings. At the bottom there, after the Happiness question, you'll find the link "Add a new 5-point rating scale question." Click it, add the text to be asked and choose an icon to be used for answering. You can also click and drag to order the questions. It takes just one click and as such just seconds to answer each question. Feel free to ask anything: about satisfaction and happiness, progress, performance, cooperation and collaboration, any kind of progress or feelings. The questions can relate either to person, team or company. You can think of 5-point rating questions also as of so-called Likert scale used for bipolar agree/disagree questions. And as always, feel free to roll your own and tell us what do YOU want to know from your team in the comments or hello@weekdone.com. We might add them as default options for everyone, giving you credit and some Weekdone stickers. The first graph shows up to four 5-point ratings. Hover over the legend of any of them to see it in more detail. See something drop and it's time to act as a leader. Second graph shows the negative items, like problems reported and overdue items not done in a week. Here the higher the score, the worse it is. Third graph shows the planned item completion ratio and our magical Weekscore total team indicator on a 100% scale. Your goal is to hit 100%. The new dashboard has been designed to see week by week trends much better, thus making it even more actionable for you. Using the new 5-point questions and seeing them together with other key metrics will help you, the leader, always to have better insights at your fingertips. Enjoy Weekdone and if you have not tried it yet, it's free for to try for 15 days and forever free for teams of up to 3 people. Sign up here.